The clavichords: Paul Simmonds and Julian Perkins are playing an unfretted clavichord after a C. G. Hubert instrument of 1771, made in 1986 by Karin Richter, who in the same year also made the fretted instrument after Bodechtel played by Micaela Schmitz. Both were kindly provided and prepared by Paul Simmonds. This extraordinarily enterprising event prompts wide ranging, indeed rambling, thoughts, best perhaps conveyed in an Article. Ever since my student days, when I bought a Hodsdon clavichord (so as to be able to play during the night without disturbing fellow-residents) I have cherished this precious instrument which has long remained at the periphery of music lovers' awareness. Experiencing rare opportunities to hear the clavichord epitomises Musical Pointers' so-far fruitlessly sustained campaign against the crass noise pollution of the new Century's musical environment; see Why not amplify? . I have always thought the clavichord ripe for developing a contemporary repertoire; I once recorded (on ancient acetate) some of Bartok's Mikrokosmos, which suit it perfectly, and Matyas Seiber gave me the manuscript of a piece he had composed for Susi Jeans. In 2004 the BCS held (probably for the first time?) a competition for new clavichord compositions, judged by a panel including Paul Simmonds, who this afternoon played a pleasant Hindemithian Suite (1956) by Jurg Baur (b.1918) and some of the awarding winning pieces, including Gary Carpenter's Van Assendelft's Vermeer, which had deservedly gained first prize at the competition and will be released on a BCS sponsored CD in September. Several composers were present in this ideal venue, amongst them the veteran Stephen Dodgson, whose two unpublished clavichord Suites were given in newly revised versions by Julian Perkins *, whose account of Herbert Howells' My Lord Sandwich's Dreame was the most beautiful moment of the whole long afternoon. The BCS should spare no pains in trying to get Paul to record (on Karin Richter's marvellous large fret-free Hubert (1771) copy) the whole of Herbert Howells' seminal books, Lambert's Clavichord and Howell's Clavichord, which really don't sound good in John McCabe's recording on modern piano (pace Rob Barnett). 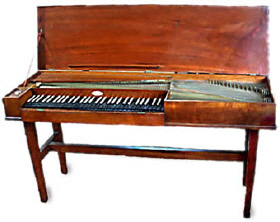 Another of this great Britain-based maker's instruments was used by Micaela Schmitz to introduce the first complete performance of another 2004 competition winner, Julia Usher's Clavicle, given by Micaela Schmitz (editor of Harpsichord and Fortepiano and no mean clavichordist !). This required Richter's fretted instrument (after Bodechtel) for some of its special effects, and Usher has expanded the timbral possibilities and dynamic range of this most intimate of all instruments by exploring the strings as well as the keyboard. A few random thoughts to conclude. The clavichord is, essentially, a domestic instrument which needs a quiet environment and is heard at its best by the player (c.p. the grand piano or the organ). Hearing three clavichordists on two very different instruments, and from three different positions in the church, I was surprised at how critical is the precise seating position; others endorsed my observations. The clavichord is best heard close to, and from the right side, with the strings over the sound-board unimpeded by anything (such as the player's body!). The earlier problems of recording the clavichord have long been solved and it is ideal for home listening. It also will lend itself to promotion on DVD - I know none other clavichord DVD than Usher's; here it is heard but not seen! 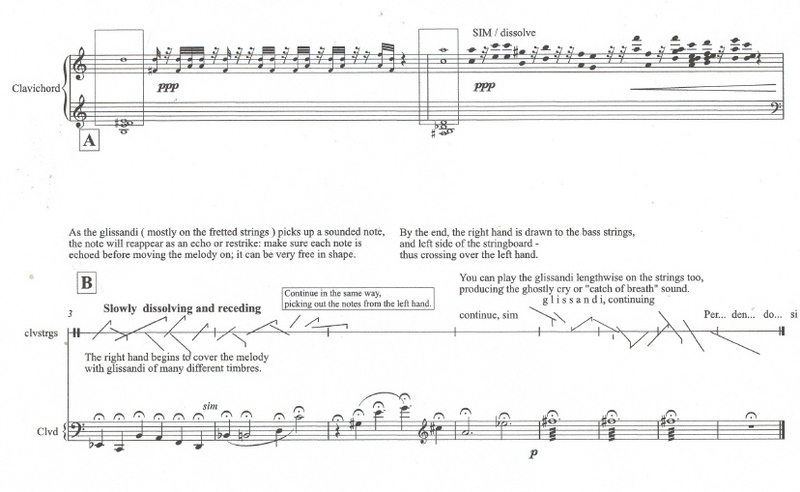 A revised version of Clavicle is in preparation, and a recording with Micaela Schmitz (who has been closely involved in its development) is highly desirable. The afternoon spent with clavichords in a public situation made for an oasis of concentrated listening, one that everyone there will long remember. Two anecdotes may give food for thought. On the way to the Church of the Christian Community, I chanced upon a copy of Camden New Journal, the excellent local paper, with a letter from a resident protesting to English Heritage at the cessation of - and refusal to resume - classical concerts in Kenwood because of complaints from neighbours about excessive noise. " - - What you fail to accept or even acknowledge despite all the correspondence in the local press is that classical concerts at Kenwood do not need, and never had, amplified sound. The beauty of those concerts was the magic of the sound drifting across the lake - - etc". Living in the area in my youth, I endorse that from my own experience in a bygone age.